Give eating out a whole new meaning with Sonora – A great dining set which can comfortably seat 8 with room for a little one. 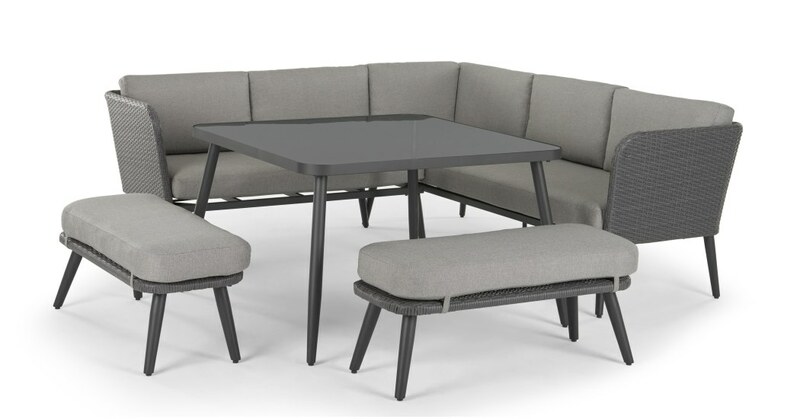 This set includes a corner sofa, two benches, and a perfectly proportioned dining table so you can easily rearrange your set up to suit your needs. Designed with clean lines and a sophisticated colour palette, it’s a minimalist collection that will enhance your greenery and blooms. Sonora comes with detachable, padded cushions for extra comfiness. It's built to endure the weather which is handy - just remember to cover it or take your cushions inside during heavy rain.